Pears are not my favourite fruit. 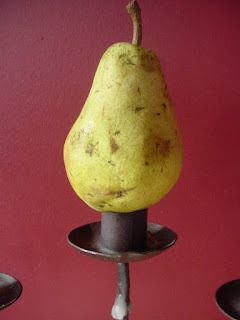 I’m embarassed to tell you that the first time I enjoyed a pear, it was canned. In syrup. However, I have really come to appreciate pears, sliced raw alongside good crackers and cheese (That Dutchman’s Dragon’s Breath is my favourite right now), baked with apples in a crumble pie, poached in red wine with raspberries, and even roasted on a pizza with duck confit and bleu cheese. I’ve even gone so far as to come up with my own version of a Pear Upside Down Cake, baked in a cast iron skillet. Pear trees abound in the Valley, and their early blossoms brighten up what can be a slow start to spring. In the cool of autumn, pears baked into warm desserts are homey and comforting. I’m waiting for a really nice cold day to try out an Apple and Pear Crostada. I’ll ask Sean to build a fire and when the kids get off the bus, a warm treat will be waiting for them. Beautiful local pears are available in stores and farmers markets right now. Noggins Corner grows 13 varieties including Bosc, Sheldon, Conferens, Bartlett and Flemish Beauty. Pears will ripen quickly if stored at room temperature, so store most of your purchase in the fridge and remove a few at a time for fresh eating. For baking, pears are fine straight from the fridge. Serve these sliced with cheese and crackers, or with a drizzle of honey and a spoonful of vanilla yogurt. They are also delicious with pancakes or hot cereal (and a weird but excellent pizza topping with bleu cheese). Preheat oven to 350°. Peel the pears and cut in half. Using a melon baller or small spoon, remove the core neatly. Place the pears in a small baking dish and rub all over with a little oil. Bake for 20-30 minutes, until softened and beginning to brown around the edges. Let cool and serve right away, or refrigerate tightly covered until needed. Ok, I only partly made it up. The cake part is really a recipe for “Vanilla Ricotta Muffins” from Sunshine Cafe, an excellent breakfast cookbook from Mollie Katzen. Therefore, eating this cake for breakfast is fully justified. Preheat oven to 350°. Heat a 9 or 10 inch cast iron skillet over medium heat and throw in the butter. When it melts, add the pears. Cook the pears, stirring gently and often, for 8-10 minutes, until slightly softened. Drizzle in the syrup or sprinkle in the brown sugar and cook another minute. Remove the pan from the heat. In a large bowl, combine the flour, milk powder, salt, baking powder, sugar and cinnamon. In a second bowl, whisk together the cheese, milk, eggs, vanilla and butter. Add the ricotta mixture to the dry ingredients and mix with a spoon until just combined. Arrange the pears in the pan so they are in an even layer and pour the batter over them. Place the pan in the middle of the oven and bake for 25-30 minutes, until firm and browned. Cut into wedges and invert each onto a serving plate, topping with whipped cream (flavoured with a grating of fresh nutmeg if you like). I saw the post was "Pears" and I have to admit I waited a day or two to read it as pears are NOT my favourite fruit. Then I saw the first line "Pears are not my favourite fruit" and I felt a little love in my heart.